Lene Tranberg of Lundgaard & Tranberg Architects will present her firm’s work in a public lecture moderated by Karen Stein. Lene Tranberg established Lundgaard & Tranberg Architects with Boje Lundgaard in 1985, which they managed and developed together until 2004. Today the Cophenhagen-based firm is run in collaboration with six other partners and employs 65 people. Tranberg seeks to impart a “sensory and site-specific approach” to architecture while privileging “flowing transitions between building and nature that activate new identities and relationships within urban contexts.” In addition to its built work, the firm collaborates with leading research centers and the construction sector on sustainable design methods for housing. 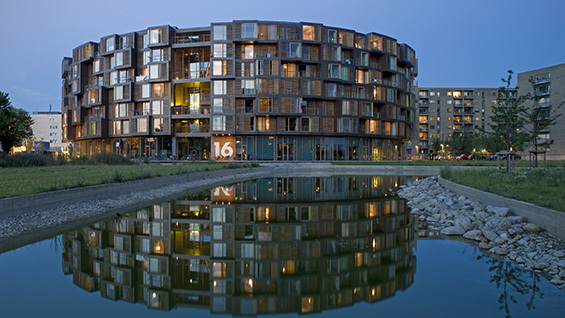 In 2005 the firm completed the Tietgen Dormitory, which houses 400 Copenhagen University students in a cylindrical building incorporating wood paneling and featuring an interior courtyard used as a communal space for residents. On the Copenhagen harbor, Lundgaard & Tranberg Architects designed the Royal Danish Playhouse, a performing arts center that incorporates a waterfront promenade-facing public lobby that welcomes all visitors – not just those with performance tickets. In 2013, they were shortlisted to design the Nobel Foundation’s offices in Stockholm and their Axel Towers residences, a cluster of five cylindrical towers located in Copenhagen, will be completed in 2017. Tranberg is an adjunct professor at the Royal Academy of Fine Arts in Copenhagen. She has served as visiting professor at The University of Washington, Seattle, and is an honorary member of the American Institute of Architects. Most recently, she was a member of the Jury at the European Union Prize for Contemporary Architecture – Mies van der Rohe Award 2015. Five of Lundgaard & Tranberg Architect’s buildings have been awarded the prestigious RIBA European Award by The Royal Institute of British Architects. Karen Stein is a writer, editor, architectural consultant, and the executive director of the George Nelson Foundation.